Why use a watch to simply tell the time when it can do so much more? Discover how Van Cleef & Arpels depicts a delightful tale of romance using the dial of the Lady Arpels Pont des Amoureux Watch as a canvas. The Poetic Complications collection is where Van Cleef & Arpels flaunt their extraordinary technical skills to transform watch dials into visual experiences. From fluttering butterflies to moving planets to two lovers meeting on a bridge, the Poetic Complications timepieces use traditional watchmaking mechanisms to indicate the time in an imaginative and emotional way. A delight to witness and wear, Van Cleef & Arpels’s Poetic Complication watches are truly special examples of watchmaking mastery. A particularly intriguing piece from the Van Cleef & Arpels’s Poetic Complication collection is the Lady Arpels Pont des Amoureux Watch, which takes a romantic approach to displaying the time. 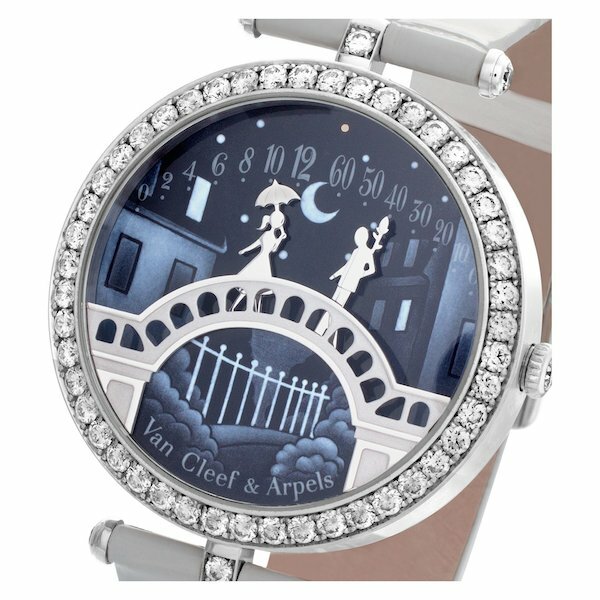 Aptly named the Pont des Amourex (French for Lover’s Bridge), this Van Cleef & Arpels watch displays two lovers meeting on the Pont des Art in Paris. The two figurines are positioned below floating numerals in the sky to indicate the time–she stands under the hours and he stands under the minutes. As the couple moves toward each other, they meet twice a day–at noon and at midnight– for a kiss. 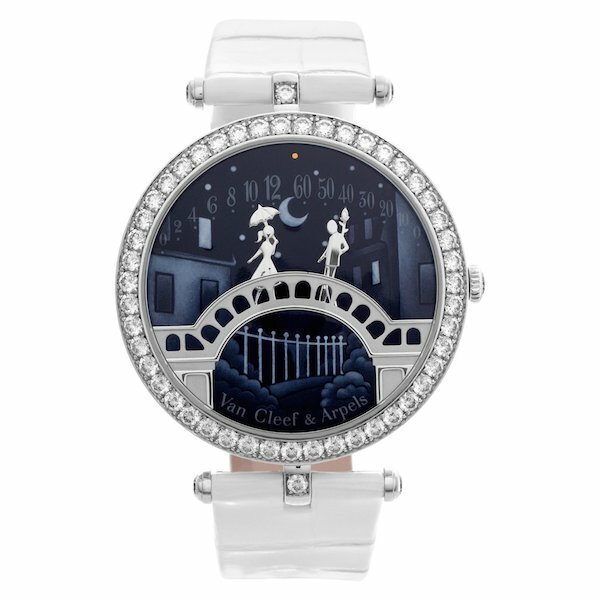 The two lovers and the sculpted bridge they meet on are crafted in 18k white gold and they sit on an incredibly detailed grisaille enamel dial. Grisaille enameling is a technique first developed for Van Cleef & Arpels, which includes working with white paint on a smooth black background. The finely ground enamel is applied with a brush and then a needle is used to complete the drawing. As you can imagine, it takes great skill on the part of the artisan to work on such a small canvas to create a painting with such intricate details. The dial is housed in a 38 mm white gold case further embellished with a diamond-set bezel. Diamonds are also found on the white gold winding crown, white gold lugs, and white gold pin buckle attached to the glossy white alligator strap. Given that Van Cleef & Arpels is one of the leading jewelry brands in the world, the diamonds used on the Lady Arpels Pont des Amoureux Watch are DEF, IF, and VVS diamonds. Powering the Lady Arpels Pont des Amoureux Watch is a mechanical manual winding movement equipped with an Agenhor retrograde module and a 30-hour power reserve. This is especially significant for a ladies’ watch as most women’s watches depend on a quartz caliber for power. 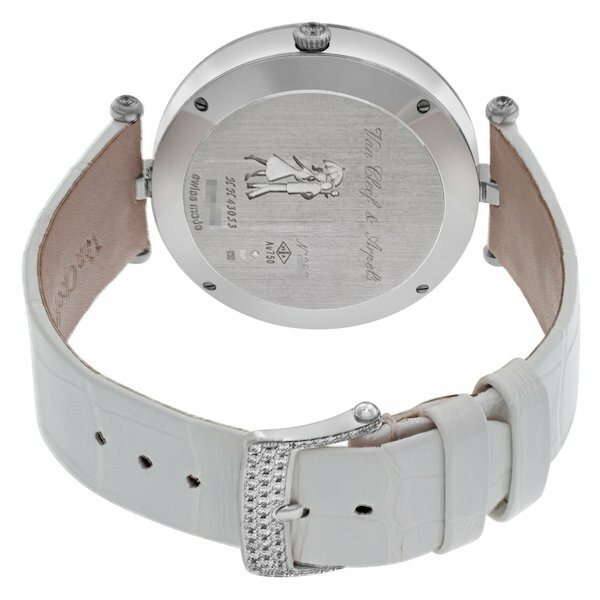 So it’s always refreshing to see a mechanical movement within a luxury ladies watch. One of the most romantic ladies’ watches we’ve ever seen, the Van Cleef & Arpels Lady Arpels Pont des Amoureux Watch is a joyful celebration of love. And it would certainly be a grand gesture to your soulmate if it were given as a gift. Celine is a freelance luxury watch writer who has enjoyed working in the horology industry for over ten years. Like many of the high-end timepieces she writes about, she comes from Switzerland—the heart of fine watchmaking. From Singapore to Montreal to Geneva to Dubai, Celine has lived all over the world but now calls Southern California home.